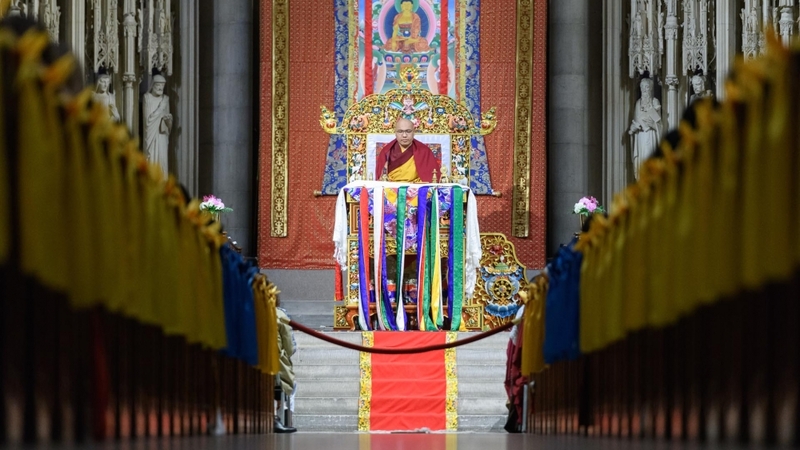 His Holiness began today’s teachings in noting that yesterday he had finished an explanation of relative bodhichitta and today he would present the corresponding absolute bodhichitta. “The main difference between relative and absolute bodhichitta,” he began, “is in the object on which they focus. Relative bodhichitta is turned toward the things of the relative, conventional world, and absolute bodhichitta is turned toward dharmata or the ultimate. Since this is the mere resting in mind’s abiding nature, it is called absolute bodhichitta. Usually when we say, “bodhichitta” or “to generate bodhichitta,” we are referring to relative bodhichitta; absolute bodhichitta really points to the wisdom that realizes emptiness. It has been given the name “bodhichitta,” but it is not generated in the same way that relative bodhichitta is. The mind itself is forever free of fabrications. Of a subject and object is the practice of a bodhisattva. “All the things that appear to us externally and internally may seem to be real and independent of each other, but they are just projections or labels imposed by our mind. Ultimately, not one object can be found that is truly existent. This perspective that sees the imputed nature of an object, reveals its nature. This is absolute bodhichitta in the post-meditation phase. “The second line, ‘Mind itself is forever free of fabrications,’ indicates that the mind that superimposes or imputes these labels is also not established through having its own nature. From beginningless time, these objects and subjects, which include all phenomena whatsoever, are free of all mental constructions. Knowing them just as they are, we see that the externally apprehended object and the internally apprehending mind are not established at all and then rest in this state free of grasping or free of mental activity or engagement (yid la mi byed pa in Tibetan and amanasikara in Sanskrit). This is the phase of meditation related to absolute bodhichitta; as they meditate, bodhisattvas bring into their experience absolute bodhichitta, or you could say, they meditate in the state of emptiness. “In another of his writings, Gyalse Thogme Zangpo, the author of this text, wrote, ‘Rest nondually in the state of non-elaboration,’ which comes down to the same meaning as this verse. In other words, bodhisattvas rest within emptiness free of elaboration, which is the nature of all phenomena, all subjects and all objects. This resting in meditation on absolute bodhichitta means being able to rest within a meditation where the mind is free of mental constructs, just like its nature. We are not engaged in the mental activity of grasping onto signs of any kind, or you could say that we are free of projecting any mental constructs related to outer or inner objects. “Within the Kagyu tradition one of the foremost practices is mahamudra, which has come down to us from Lord Maitripa. His special teachings are called the Amanasikara Cycle or the Cycle of Freedom from Mental Engagement. The Sanskrit term amanasikara can be explained in two ways: mental engagement in emptiness or the more well-known one, freedom from mental engagement. They have the same meaning and refer to resting in even placement on absolute bodhichitta. “The same point is made by Bengar Jampel Zangpo in his Short Vajradhara Lineage Prayer that we recite at the beginning of the teachings. He writes: ‘The absence of distraction is the body of meditation as is taught. To the meditator who rests freshly in whatever arises without contrivance or alteration, grant your blessings that meditation be free from conceptualization.’ This describes resting relaxed and one-pointed in a meditation that does not fabricate anything in relation to the nature of phenomena; our intellect does not alter this nature in any way. The teaching of Maitripa is the same as the meditation of absolute bodhichitta. To give up attachment is the practice of a bodhisattva. “A pleasant object that a specific person finds attractive could be a friend, something beautiful to see or melodious to hear, and so on. All of these are potential objects of attachment; however, no matter what object it might be, pleasant or not, ultimately it has no essence; it is not established as it appears and resembles a beautiful rainbow in summertime. Just as we know not to fixate on the appearance of a transitory rainbow, it is the practice of a bodhisattva to abandon clinging to the reality of objects, including those that are beautiful. This is the instruction for post-meditation. To take these delusive appearances as real, how tiring! To see them as delusions is the practice of a bodhisattva. “When we encounter something we regard as unpleasant, such as a person we consider our enemy, a grating sound, a feeling of misery, or the suffering of others, and so on, we can regard them as no more real than dreaming that your child or someone you love dearly has died and then feeling terribly sad. In a similar way, we exhaust ourselves by fixating on pleasant or unpleasant objects as real. And so the instruction here is not to strongly identify with our projections, such as this person is my enemy, but to recognize that concept to be like a dream, an illusion, or a delusive appearance. This is the instruction on how to relinquish fixation on the reality of unpleasant objects in post-meditation. “In sum, in both these cases of pleasant and unpleasant objects and abandoning fixation on the reality of objects of attachment or objects of aversion, what is important is to let go of taking the objects to be real, for they are nothing but delusions. “The main way we need to think about this is that even though we experience different appearances, actually, they are only mere appearance. Nevertheless, seeing them as independent entities, we take them to be real. But if you ask, ‘Is there some real object corresponding to what is appearing to us?’ The answer is ‘No.’ This situation is described as ‘free of basis and root,’ or ‘appearing though nonexistent.’ Why so? The object as it appears to us did not exist in the beginning, does not remain in the middle, and does not cease in the end. Therefore, it has no basis or root and appears though it does not exist. However, a mere appearance, coming from the interdependent gathering of causes and conditions, does arise. “This situation resembles the passing images or the reflections we see on television. Do those images as they appear to us, exist in the screen? No. They are mere reflections of emptiness. Taking the measure of delusive appearances, we find that they merely arise from interdependence, the coming together of causes and conditions, and so there is no reason to cling to them as real. This is the way we should think about not clinging to the reality of things. In sum, we do not need to negate appearances, but just our clinging to them as real. “This teaching has very real implications for our lives: since we fixate on the reality of perceived objects or appearances, we suffer a great deal. By identifying certain objects as friends, a couple or partner, and so on, we cause ourselves a lot of misery by clinging to their supposed reality. Similarly, when we identify people as difficult, as the ones who make us miserable and whom we find hard to forgive, this fixation causes us grief as well. In both cases, the cause of our distress is not something in the perceived object, but our clinging to the falsely perceived reality of that object. The problem is not with the object, but how our minds are relating to it. This is what we need to examine. “Whether an object is pleasant or not depends on the input our minds add onto the whole situation. These externalized concepts seem so real to us. Understanding this process of reification and putting meditation on emptiness into practice is important. We join the practice of emptiness together with the objects of our attachment and aversion, which allows us to reverse these two afflictions. Otherwise, just saying, “All things are inherently empty,” does not do very much. The function of meditation on emptiness is to reduce and eventually eradicate our fixation on the perceived reality of appearances. This is what will relieve our suffering. Just spouting high-flown Dharma terms will not change you. 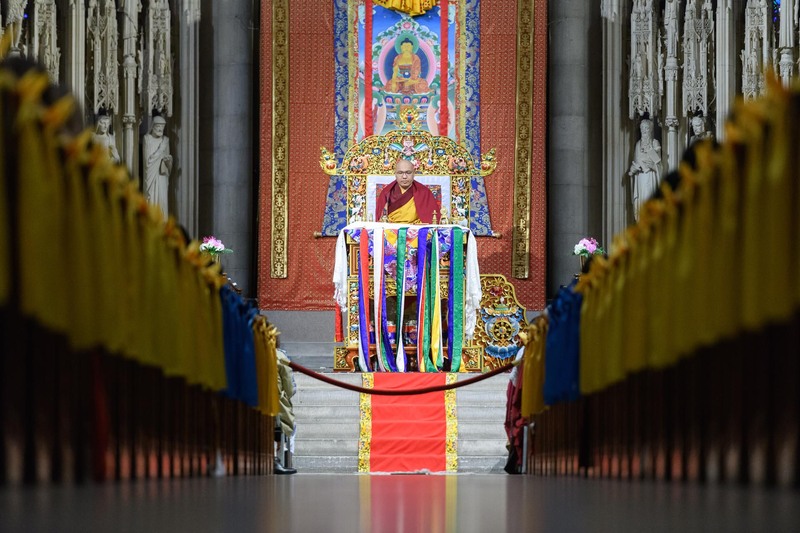 “The next section discusses various aspects of training in the cultivation of relative and absolute bodhichitta. The first of five sections is the practice of the Six Perfections or Paramitas in six verses, which briefly describe these. What need is there to mention outer objects? To be generous is the practice of a bodhisattva. “In terms of the meaning, there is not much that is difficult to understand in these six stanzas. What’s hard is putting them into practice. Taking the first perfection as an example, we might ask, ‘What is generosity?’ Is it simply giving something to another person? Food to the hungry? Clothes to those in need? A home to the homeless? Not really. It is more than this gesture of giving. Real generosity is being permeated by the wish to give, or actually embodying the giving, and then motivated by this, engaging in generous actions through our body and speech. This magnanimous attitude is the true power behind generosity. “The Kadampa masters taught, ‘The root of generosity comes down to being free of attachment.’ Likewise Geshe Sharawa (1070-1141) told his disciples, ‘I’ll not set out the benefits of giving; rather, I’ll tell you about the faults of grasping.’ These two statements arrive at the same key point. “Many people are motivated to give by their belief in the resulting benefits. They think, ‘If I give one thing, I’ll get one back. If I give two things, I’ll get two back,’ and so on. They are only thinking of the benefits they will get in the future and this means they do not understand the true generosity of a bodhisattva, which is the absence of attachment or fixation. These people are focused on having things go well for themselves and receiving something back in a future life. “It is true that acts of giving will lead to affluence in future lives, but if that is the reason why we give, not only are we ignorant of the true nature of generosity (the absence of attachment), but we are actually increasing attachment to ourselves. 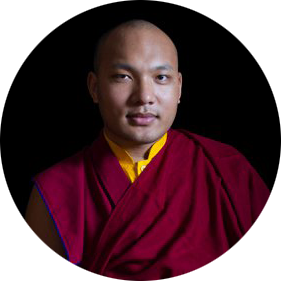 This is why Geshe Sharawa said to his disciples that he would not tell them about the positive qualities of generosity, but teach them the problems caused by attachment. If we focus on the benefits, we could ignore the true nature of generosity. “A bodhisattva’s generosity is the ability to give anything to anyone. It is giving completely free of attachment. It is not giving while still attached to something, which would make it impossible to attain the perfection of generosity. Wishing to benefit others is just a joke. Free of desire for samsara is the practice of a bodhisattva. “Moral discipline, the second Perfection, is spoken of in Shantideva’s Way of a Bodhisattva: ‘To attain the mind that discards (harming others) / You must know the perfection of moral discipline.’ Its essence is turning away from all that harms others along with its basis. In addition to this fundamental aspect, a bodhisattva’s moral discipline must also include actively helping others. The least we can do in practicing moral discipline is not to harm others. On top of this, bodhisattvas also actively benefit them. “Defining the essence of moral discipline as the mind that turns away from harming others and the basis of such harm points to the first of the three types of moral discipline—that of abstaining or of holding vows. However, moral discipline is not simply a matter of changing our outward appearance and donning the clothes of a monastic. We must have within our minds the stable intention to avoid harming others. Especially if we are engaged in the practice of a bodhisattva that includes all the perfections, our motivation is of paramount importance. The Hearers mainly work with governing their body and speech, whereas bodhisattvas focus on their minds. In addition to practicing flawless moral conduct, the bodhisattva is motivated by love and affection for others, the basis of their moral discipline. A mere absence of flaws in our conduct is not enough. “The principal actions governed by moral discipline, they are virtuous actions, such as avoiding the ten forms of wrongdoing, which include three of body, four of speech, and three of mind. The first seven of body and speech are considered actions and the last three, paths of action. Looking at these ten, we can differentiate the pratimoksha vows (of individual liberation) and those of a bodhisattva. “For the first set of vows, if we engage in any of the seven wrongdoings of body or speech, that is a contravention of the vows; however engaging in one of the three wrongdoings of mind, such as malice or wishing to harm others, does not contravene the pratimoksha vow. By contrast, the moral discipline of a bodhisattva places greater emphasis on avoiding the three unvirtuous paths of action related to the mind. For example, if a bodhisattva feels malice, that is a clear breaking of their moral discipline. In general, our state of mind, such as malice, is private and hidden from others. Therefore, the Kadampa masters taught that the principal way to maintain pure moral discipline, especially that of a bodhisattva, is through constantly reflecting on the results of our actions, because if these are not pure, then our moral discipline is also not pure. We use our mindfulness and vigilance to see if we are feeling malice or not and what its consequences might be. What is happening in our mind like this cannot be seen or known through external appearances. In this way the bodhisattva’s discipline reflects a deeper understanding, which we should study. “It could be the case that we are careful in what we do with our body and speech, since people can see and hear us, but not careful with our mind as it is hidden from others. Bodhisattvas, however, not only have to be careful in what they do with their body and speech, but they must be even more careful about what is happening in their minds. Anything that harms is a treasury of jewels. To be patient is the practice of a bodhisattva. “There are three main aspects to patience, which have different characteristics and can be divided into the external and internal. The most important and pithy definition of patience can be found in Nagarjuna’s Garland of Views (Ratnavali), which states that patience means the absence of anger. It is further taught that having patience requires a certain freedom from arrogance. It is said that the root of patience is regarding oneself as lower than others: See yourself as lower and turn around your anger. With such humility, arrogance falls away, and reduced pride allows for less anger. “Patience is an extremely important aspect of a bodhisattva’s training, because without it, we could respond to someone harming us by doing harm in return, so we are not reversing our anger. If we cannot do this, then how could we benefit others? We would not be able to enter the gate of the mahayana teachings or even start out on this path. Patience is indispensable from the beginning. “The practice of patience starts with recognizing the problem of anger and the difficulties it causes and also seeing that we can dispense with anger. We can say to our anger, “I don’t need you.” We should have the courage that can tell anger, “I can deal with you.” By not doing this and forcing ourselves to override it, we are actually supporting our anger. What we need to work with anger is the momentum created by virtuous actions and states of mind plus remembering all the difficulties anger creates. These two will allow us to be patient with anger, to work with it and not to push ourselves in the wrong way. We could think that exercising patience means putting a lid on our anger or covering it up, but actually, we should just let the anger go. “In order to practice patience, sometimes it is good that anger arises, because if we do not just push it away, we can examine how it arose and analyze its faults and character. We can look carefully to see the negative effect of what it is doing to us and then let go of it. This analysis of anger is a good thing. If anger arises and immediately we push it back down, we lose an opportunity to learn about it. Putting a lid on anger and just keeping it inside can create problems, so we should avoid doing this. The practice of patience is letting anger go. That benefit every being, is the practice of a bodhisattva. In his Ratnavali, Nagarjuna defines diligence as enthusiasm for good or for what is virtuous. When practicing any of the Six Perfections, we must be focused on virtuous actions; otherwise, it is not the practice of virtue. The early Kadampa masters defined the best diligence as giving up meaningless or worldly activities. This is actually giving up one of the three types of laziness—attachment to negative actions. This laziness is overcome by giving up attachment to pointless or mundane activity.